Turn Your Photo into Funny and Morphing Movie! 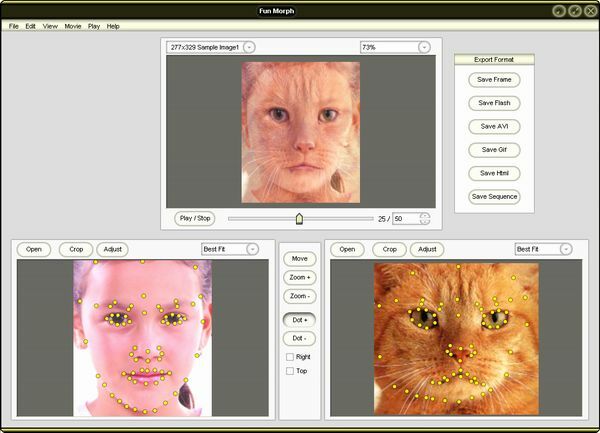 Zeallsoft Fun Morph is funny and easy to use photo morphing and warping software. Morph and warp face or image of friends, family, celebrities. Turn them into a cat or a pig or any jokes! You can save movie in all popular formats, including avi video, web page, email, greeting cards, animated gif, picture sequence and etc. Let your imagination run wild, share your morph movie with all your friends and family, they are absolutely incredible! Creating Photo Morphing is as Easy as 1, 2, 3! The fast and simple wizard can help you to finish most steps. Real Time preview your designs. You can resize, crop, adjust, enhance and deform your photo. Such as Project Load/Save, Zoom In/Out, Redo/Undo and etc. Print and mail your card designs or email. Including AVI, SWF, GIF, HTML and etc. Put Your Face into Fantasy Fun Photo! Distorting face and producing surreal effects! Automatic Batch Photo Editing Converter Software!